In the four years since it debuted, photo sharing/social networking/moments app Path has twisted, turned, pivoted and morphed so often that it’s hard to really describe the service in a single breath. If you want to use the company’s own words, it bills itself as a “quality, private social network,” and in its initial incarnation as a photo-sharing app that gave each user a 50-friend limit, it appeared to be the private person’s rebuttal to Facebook, where CEO Dave Morin co-invented Facebook’s application platform, Facebook Connect. Nowadays, that photo sharing is accompanied by messaging, ambient location tracking, archiving major life milestones, and interacting with friends. Aside from that laundry list of functions, Path also allows users to shoot, edit and filter their photos just like Instagram (s fb), send one-to-one messages with stickers like Line and other similar messaging products and create private circles similar to Google+ (s goog). These features, and many more that have since vaporized from the app over time, have grown and shrunk as Path itself has focused and refocused over the years. The company said that it had 20 million registered users in October of last year, but according to the Verge, it has 4 million daily users. And on Friday, the company made yet another shift: capitalizing on similar moves from Facebook and Foursquare, Path introduced a new app called Path Talk that spins out the messaging feature, including its sticker platform and premium plan. But it’s not just that: bolstered by the acquisition of messaging service TalkTo, Path users will soon be able to use the app to text message places and businesses. For example, users can text a local restaurant for reservations and receive an answer. Path Talk will also have ephemeral messaging, meaning that text will disappear after 24 hours if not saved through other means, a feature that’s the most buzzed-about topic in social media at present, with the appeal of apps like Snapchat and the recent debut of Facebook’s Slingshot. It also has an “Ambient Status” feature that uses the phone’s sensors to give friends an idea of what you’re doing, where you’re going and what you’re listening to. You can text photos, voice messages, videos, maps, music, movies, and high quality video, too. Does it sound exhausting? That’s because it is. 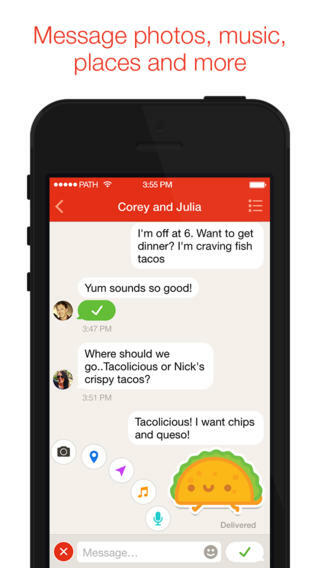 The issue with Path is that it can’t resist hopping on a new social trend. The app takes cues from practically every other social media platform in the public consciousness, seen most explicitly in its decision to hop on the ephemeral trend pioneered by Snapchat. As a result, it’s hard to explain to anyone why they should use path or find cues about how to actually use the service. Even in its decision to “simplify” with Path Talk, the new app chock full of tons of features that kind-of but not-quite match up. And therein lies the rub of Path: just because these apps can do these things doesn’t mean they should. Path touts itself as having prioritized user experience design, but it’s full of so many options that it can be tough to recognize when and how its best used. While it tries to simplify the experience with Path Talk, the app is still full of so many trendy, novel features that don’t necessarily improve messaging overall. And, with so many messaging services already in the space, Path needs that clear distinction to make Path Talk successful. If Morin and company really want to chase simple, they should take it to heart by reinventing Path around one trend instead of every trend — say, becoming a fully-fledged ambient location app or doubling down on its original photo sharing premise. By picking a clear direction and advancing the story beyond its competitors, instead of just chasing the next trend, Path could become a much more useful and distinct place to share with friends. Good point made! Less is often more! The bigger issue with many social networks is that they do have goals, but no clear vision or purpose. Without those, there is no guidance in decision making on how to achieve your goals and you end up with a blur like you just described.